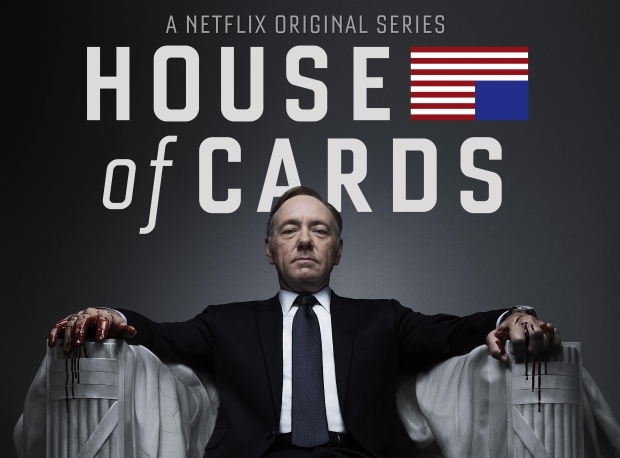 I’m not in any position to evaluate how accurately American politics is depicted in Netflix’s remake of House of Cards, but if people even think that Congress and the White House are run solely on greed, ambition, and ruthless back-stabbing, as the show suggests, no wonder voter turnout is so low. The series is one of the most dispiriting things I’ve ever watched — not just because of its relentless cynicism about both human nature and democracy but because it seems to have embraced that nihilistic cynicism so wholeheartedly. Imagine how different the show would be if it wrapped the story of its sociopathic central characters in some irony, or developed their story as tragedy, so that we could be caught up in their rise — as we are with Shakespeare’s Richard III or Macbeth, or with Thackeray’s Becky Sharp — but also see them suffer and fall. Instead, their vicious dishonesty wins them triumph after triumph, while the few around them who so much as raise questions, never mind try to stand for something else, are weak and ineffectual — or just dull. “She did what she had to do,” one character says in Season 2 about another who betrayed him for her own political gain: the show does not provide any alternative narrative, so even if we are repelled watching we have to look outside the box (literally!) to find a critique that goes beyond wishful thinking. Richard III is definitely an apt point of reference (even the wink-y addresses to the audience, which I know are a carry-over from the original British series, are reminiscent of Richard’s gleefully oversharing monologues). But Shakespeare’s play is about ambition and greed and politics in a way that I don’t think House of Cards is. The show seems to me to reduce villainy purely to spectacle. It was just interesting enough that I kept watching (how far can they go? will they perhaps meet their match, or get their comeuppance?) but it didn’t provoke any serious thought about the issues its plot-lines touch on: unlike, say, The Wire or Deadwood (both of which are much more graphically and disturbingly violent but which reach for insight and explanations — and improvement), House of Cards operates purely at the level of individual malice (or, much more occasionally, good intentions). Francis is also much less charismatic than Richard, which is at least partly the fault of the writers (who often mangle idioms or resort to cliches) but I think can also be blamed on Kevin Spacey’s performance, which (like everyone else’s in the show) seemed extraordinarily limited in range. Most of the characters require at most two facial expressions over the whole series, and since the show is premised on deceit, the dominant one for almost everybody is a kind of grim deadpan stare. The other inevitable comparison is to The West Wing. I joked on Twitter during Season 1 that I’d need to watch it all the way through (again!) as an antidote to House of Cards, and now that I’ve finished both seasons of House of Cards I don’t see any reason to take that back. Whatever its faults, The West Wing at its best shows recognizably human people struggling to make the messy process of democracy — with its competing interests and different ideologies and, yes, its components of greed and ambition along with its idealism — serve the common good. It works with the clash between what Francis characterizes (self-servingly, of course) as “ruthless pragmatism” and a high-minded commitment to public service. It has a quality of sincerity as a show, and allows for the same possibility in its characters. Where are the people in House of Cards who give a damn about ideas, or about other people, including — crucially, in a show that could be about governance in some deep way — those they are supposed to serve? Where is even the possibility of gravitas? Where is the capacity for real and difficult moral struggle? You might with justice say that these are simply not House of Cards’s concerns: that it’s not that kind of show. And you’d be right — and that would be exactly why, though I did watch it all, I won’t watch it again, whereas the show that gave me the episodes “In the Shadow of Two Gunmen” or this extraordinary confrontation between an earthly and a higher power is one I’ll go back to over and over. I watched three episodes of House of Cards with my roommate a while ago, and dispiriting is exactly the word for it. I love Robin Wright and I want to see her working, and I love her particularly in this kind of ruthless role, but that’s not enough to make me keep watching this show. It also seems tremendously self-serious, even more so than The West Wing (far from the least self-serious of shows). I’m pretty sure American politics don’t run like this. Cause I’m pretty sure most politicians are not smart or focused enough to do long-term schemes of this kind. People I’ve spoken to who have worked in politics in the past or do so now have told me that Veep, the HBO comedy with Julia Louis-Dreyfus, is a far more accurate reflection of what life in politics is like. Which is dispiriting in its own way…. I only made it through two episodes of this, and I really liked the British version. Honestly, though, my reason for bailing wasn’t the cynicism but Kevin Spacey’s accent. I started the British version but found it a bit dull — I’m thinking it deserves a second chance. I got used to Spacey’s drawl but it did grate. He’s a good actor, and I would say he deserves better but he’s also an executive producer on the show so he must like it well enough. Agreed with all of the above. My husband and I watched maybe three episodes of House of Cards and found it too unidimensional, lacking in character complexity. It didn’t challenge us to think about anything in a new light . . . just the same old cynicism. What’s original about that? We also found the voice-over annoying, as if they didn’t know how to portray what they wanted to portray, or didn’t give the viewing audience credit for being intelligent enough to figure things out for themselves.